Don’t let the food fool you, this post is actually about the container. Though I must confess that I still own and use plastic (gasp!) containers on a regular basis, I am adamant about glass for some things, particularly warm or hot food. I just don’t trust plastic, even the “BPA-free” plastic. I figure it just contains some yet-to-be discovered, and perhaps worse, toxin leaching into my food. 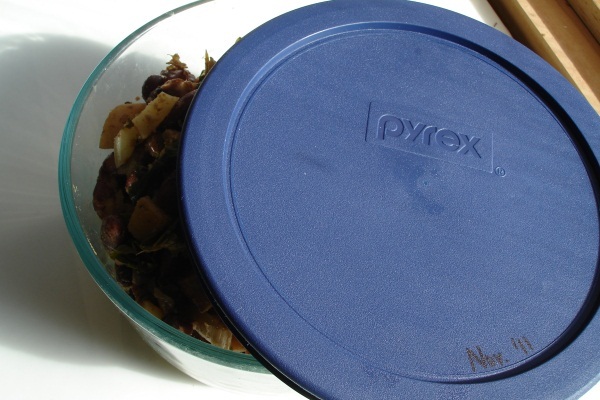 I cringe when I see coworkers nuking their lunches in plastic containers — yikes! Unless the food cools to room temperature first (at which point we’re probably in the bacteria-growth danger zone), we store all of our leftovers in glass containers. We also use glass to transport our lunches for easy microwave heating at work. Though it’s a compromise because it still involves plastic, we’ve found that glass containers with plastic lids work well. This container style forms a relatively good seal for transporting the food to and from work, which can involve a good bit of jostling. If we fill the containers to the brim, we refrigerate and put the lids on after the food is cool, and we remove the lids before reheating the food — one of those “not perfect, but good enough” solutions. With normal use and wear (i.e., not getting dropped on a hard surface), the glass containers have quite a long life. That makes the plastic the weakest link. After a couple of years of regular use, the plastic lids started showing their age, cracking at the edges, no longer forming a good seal. Over a year ago, I searched for replacement lids in vain, frustrated that I couldn’t buy just a lid to go with the container that was still in perfectly good shape. I’m rather certain I contacted the company directly and was told they didn’t make replacements — argh! In the meantime, we wanted to expand our glass container collection and reluctantly purchased two sets of the same style, knowing about the lid issue. To maximize the shipment, we ordered a couple of spare lids for each size of glass container, including some for my MIL who has the same containers with the same lid issues. (Speaking of the shipment — ridiculously over-packaged! Must remember to add “please minimize/avoid plastic when packing.”) While it’s frustrating knowing that these lids will also wear out, I’m happy to get more good use out of the glass. 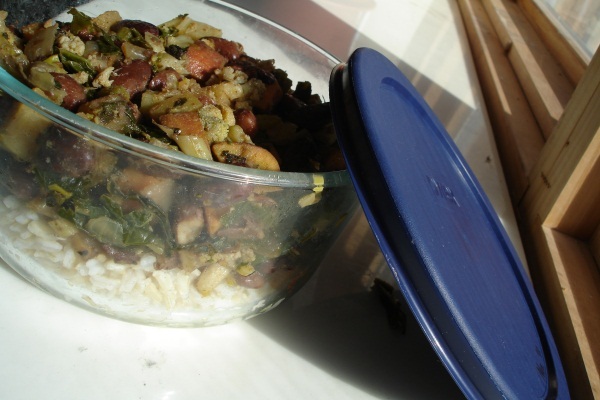 This entry was posted in Green Ideas, Health and tagged bpa, glass containers, plastic, pyrex. Bookmark the permalink. You’re welcome. I hesitated to share it, because I didn’t want it to seem that I’m advocating that particular brand. It just happens to be what we have. I just tried this link and it isn’t working. Any thoughts?